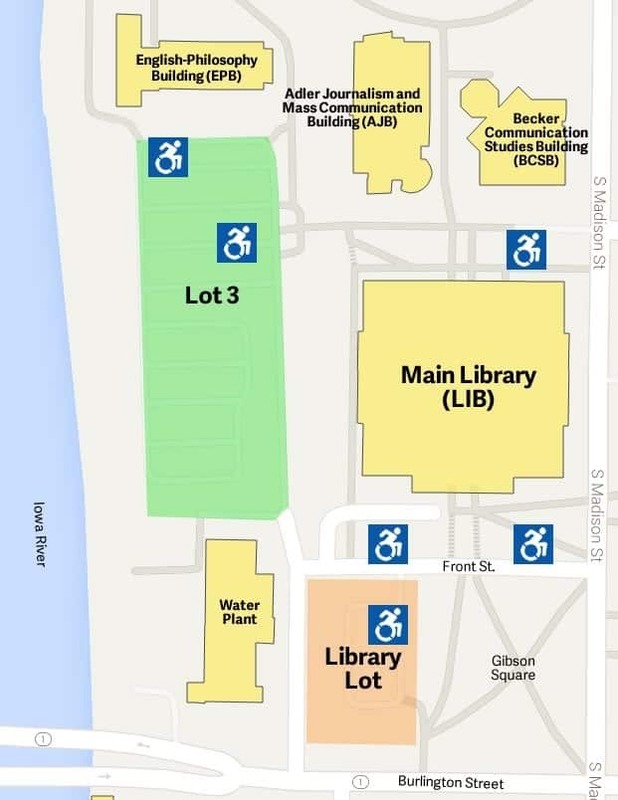 In addition to the accessible spots located in the lots described below, there is accessible parking on Front Street that runs east-west just south of the Main Library. There are also a couple of metered spots off the northeast corner of the Main Library that can be accessed right off South Madison Street. Faculty/Staff or Student Permit parking during business hours: Monday-Friday, 7:30 a.m. to 4:30 p.m. Paid parking for everyone during other times. Lot 3 is located to the west of the Main Library to the river and just south of the English Philosophy Building (EPB). It has motorcycle parking on the east side of the lot. Accessible, metered parking is available on the northwest corner (south of EPB) and located on the east side by the entrance to the pedestrian walkway under the rail tracks. The latter will only require a short walk to the north entrance of the Main Library. A Code Blue Emergency Phone is also located by the pedestrian walkway under the rail tracks. Paid parking (metered) for everyone: 24 hours, 7 days a week. There is a parking lot south of the Main Library located between the railroad tracks and Gibson Square Park. This lot affords accessible parking in the northwest corner (closest to the south entrance of the Main Library). In addition to the spaces in Lot 3, there is a small, separate lot at the southwest corner of the Main Library for motorcycle parking 24/7 by permit only. For more parking information, contact the UI’s Department of Parking and Transportation.